First, be careful. 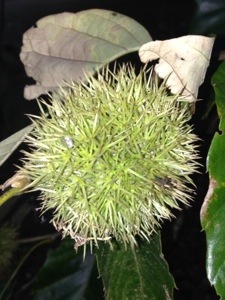 Chestnuts grow inside of a porcupine looking husk that is very sharp. These sharp pieces will go right through a flip flop and straight into your foot if you step on one. Next thing to know is that ripening chestnuts will be on the ground (brown); not still green on the tree. Once they fall, the husk will split open and give you a chestnut. The nut itself is inside the soft brown shell you pick up off the ground. Your kids will want to bite the shell open, but I advise against it. 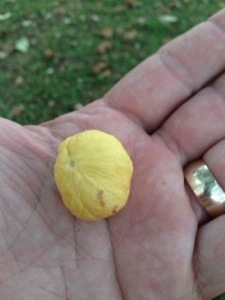 Use a tool to pull the soft shell and inside you will find a yellow chestnut! 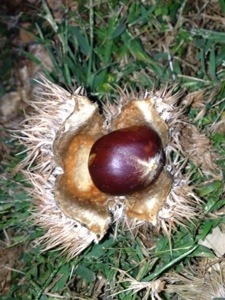 Chestnuts can be eaten raw and have a unique sweet taste. We’ve eaten many this way. 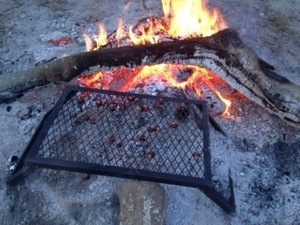 Or you may want to “roast them over an open” fire for a roasted taste. Just don’t get them too hot or they’ll pop like a firecracker…which is also fun sometimes. 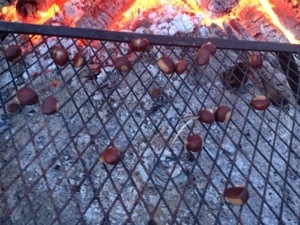 Either way, enjoying chestnuts is easy and fun.